Mulgrave Shire, an area of 1761 sq km, was united with Cairns City in 1995. Local government in the Cairns district began with the Cairns division (1880), and five years later the urban part was severed and proclaimed Cairns borough. The rural division included the areas that later became Herberton Shire and parts of Eacham and Mareeba Shires. Its coastal boundary, from Clifton Beach nearly to Innisfail, remained unchanged and the area was known as the Cairns local government division. Throughout its life the Cairns division's offices were on the Esplanade, Cairns, and in 1911 the original timber offices were replaced by a brick and concrete building. In 1902 the division was re-titled Cairns Shire, and in 1940 it was renamed Mulgrave Shire. The name originated from the Mulgrave River which has its headwaters in the Bellenden Ker Range. Upon reaching Gordonvale the river turns south, flowing along a coastal valley where it is joined by the Russell River and crosses a range, entering the Pacific. Both the Mulgrave and Russell River valleys are the heart of the sugar cane farms. The rivers were named by the explorer George Elphinstone Dalrymple in 1873 after the family antecedents of the Governor of Queensland, the Second Marquess of Normanby, who was styled Earl of Mulgrave before succeeding to his father's title. In its final shape Mulgrave Shire had about 15 km of territory north of Cairns and about 50 km to the south. Its western boundary passed along the Lamb and Bellenden Ker Ranges, intersecting with Mount Bartle Frere, Queensland's highest mountain (1622m). Rural settlement was concentrated along the sugar-growing river valleys: the Barron River in the north of the shire, the Mulgrave River with the towns of Gordonvale and Aloomba, and the Russell River valley with the town of Babinda. Between Cairns and Gordonvale numerous small streams ran off the coastal and inland ranges into a valley which includes the township of Edmonton. Sugar cane processing started with the Pyramid Mill (1882) on the Mulgrave River, about 6 km upstream from Gordonvale. At Edmonton, the Melbourne biscuit maker, Thomas Swallow, started the Hambledon mill in 1882. The Mulgrave Central mill (1896) at Gordonvale and the Babinda mill (1915) were the other two which survived. Initially, railway construction in the shire was not of great benefit. The first line was directed at inland mining centres around the Atherton Tableland. In 1897 the Cairns divisional board financed a line to Gordonvale's central mill, and by 1910 extended the line in stages to Babinda. The line was incorporated into the North Coast line in 1912. The populations of the three sugar towns increased during the 1950s and 1960s and the beach towns shared in Cairns' tourist industry. During the 1970s places such as Redlynch, Smithfield and Whiterock were joined to Cairns' urban expansion. The populations of Edmonton and Gordonvale continued to grow, but most new housing served as dormitory abodes for the Cairns workforce. In the north of the shire the coastal towns of Clifton Beach, Holloway Beach, Trinity Beach and Yorkeys Knob had populations of 2000 or more by the mid-1980s. The census for 1986 estimated the shire's urban population at 36,000 and the rural population at 5250. Cairns City's population was 42,227, and further urban expansion was destined to occur in the surrounding shire. Amalgamation of city and shire occurred in 1995. 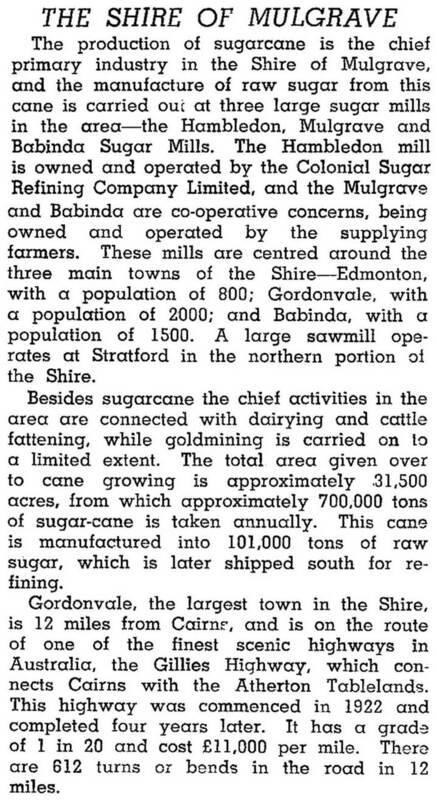 In 1992 Mulgrave Shire grew over 2 million tonnes of sugar cane on 22,500 ha. Other field crops were grown on nearly 27,000 ha and bananas were grown on 6350 ha. Livestock were limited to 2650 beef cattle. The leading employment sectors at the 1986 census were retail and wholesale (21.7% of total employment), community services (15.9%), manufacturing (10.4%), construction (8.8%), finance and property (8.5%), recreation, tourism etc (8.5%), agriculture, forestry and fishing (7.9%).